Preparation time: 5 minutes. Baking time: 5–7 minutes. Preheat oven to 350°F. Cut a thin slice off each end of the grapefruit (so that the grapefruit halves won’t roll around) and slice grapefruit in half crosswise. 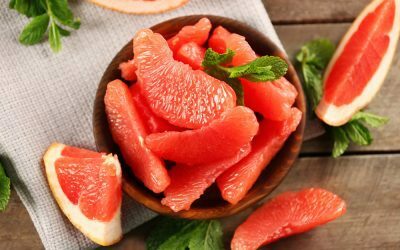 Using a knife, gently cut around grapefruit sections to loosen them inside the skin; remove seeds. Sprinkle each grapefruit half evenly with 1/2 tablespoon chocolate chips. Place grapefruit halves in a pan and bake uncovered for 5 to 7 minutes, or until chocolate chips soften. Top each grapefruit half with a strawberry and serve immediately. Exchanges per serving: 1 1/2 fruit, 1 fat. Carbohydrate choices: 2.